Atlantic Ocean, Pool or Beach? Maybe you prefer the vineyards region for a walk? "Videiras" is the portugues word for "Vine"
This is as far as you can get from run down hotels and tourist resorts. Here is a charming village where time has stopped. Stay in this luxury Beach Cottage, a Portuguese romantic manor house where the majestic mountains mirror themselves in the sea, where the lush green forest is broken by impressing water falls. Here you will listen to the waves at night and the singing of the wild Canary birds in the evening. You are five minutes by foot from the sea and natural sea water pools.Casa das Videiras has been described as pure Victorian Romantism or as a world of Harry Potter. The oldest part of the building is from 1792 and the last part from 2014. As you go up the stairs you enter the main door and face a chapel in front. The ceiling of the chapel is filled with old Chinese plates from the 18th century. To your left is the library with hundreds of old and newer books, an old doll collection, stairs to the upper terrace and exit to the main terrace. In this part you also find a double bed room and a bath room. To the right of the chapel is the upper lounge with four double bed rooms and in suite bath rooms. A staircase surrounded by stone walls goes down to the main lunges, TV room, dining room and kitchen.From the lounge there is access to the front porch.The house fit comfortably 8 persons, and you have daily maid service. You will have the whole holiday home for yourself. The kitchen is fully equipped. If you buy the ingredients for your breakfast, Natália will cook it for you at no extra charge. We can also provide the breakfast at an extra cost. In the lounge and in the library you have a TV and free WiFi. In the library there is also a desk top computer and a wide collection of books in several languages. The comfortable lounge has a closed fireplace for winter evenings. The dining room with its hand painted tiles and silk walls has a seating for eight. The three bed rooms in the first floor has double beds, each an in suite bath room with shower cabinet. The twin bed room behind the library has an attached bath room. There is an extra toilet in the ground floor. The porch and the small garden is noticed by the tiles made specially for Casa das Videiras by Don Duarte Azulejeria, with the motives from old paintings from Madeira. Casa das Videiras meens the house of the wine stock, and all the motivs are from the wine harvest, making and enjoing. The owners two dogs are found in the taberna. The stone table has as a fundament the stone from the old wine press in the house. On the library terrace you can enjoy your wine, an afternoon tea or just relax. The comfortable lounge on the ground floor, stone walls and looking into the dining room. Here you will find many hundred books in several languages and in many fields. Some dating back to the 18th century. Here is also a TV, WiFi and a desk top computer. The TV room with its more oriental settings. A stylish dining room with silk brocade and hand painted tiles on the walls, oak furniture and old china. The stony staircase from the first to the ground floor. Can you see that this was a kitchen in the 19th century? Note the ceiling decoration in this chapel. What a great way to store your antique plates. A double bed and view to the terrace. The inner shutters can seal it completely from any daylight. The direction to the in suite bath room. The bath rooms have shower cabinets, wash basin and toilet. The hair dryer is hand held. This bed room with its antique bed has the best view. A double bed and no view. You will get to the main terrace from the library. This is a fantastic place in the afternoon and night. Natália will get you chairs and table. Enjoy your wine, listen to the waves and look at the friendly peasants walking by. If you take the stairs up to the terrace above the chapel, please mind your head, you will get the most fantastic view of the North Coast, the sea and the mountains. The garden apartment has one double bed room with an extra single bed in the semi attached changing room, a bath room, kitchen with a dining table for 6 persons, and a lounge. You get down some steps to get into the garden and this apartment. This oratory has an alter from the north of Portugal, Villa de Foz Côa. It is uniquely decorated with XVIII Century Chinese plates hung up among the plaster frames in the ceiling. You find here some nice religious images, some older and some newer. In the library you have hundreds of old and some newer books in different languages: English, Norwegian, Swedish, German, French, Spanish, Italian and Latin. Some books are more than 200 years old. On the chest and on the Norse shelf you have Old Norwegian wooden works from the owner’s family. The painting above the door is a Swedish 19th century door decoration; the tapestry is a copy of the medieval Wine Season tapestry. You will also find a painting of the Casa das Videiras before the last restoration. The furniture is old, but recently restored with sheep skin. Coming into the left part of the house, you find some sculptures made by J. Rego. To the left there is a holder for making tapestry. The painting I bought on the street in Calcutta when I was working in India many years ago. The sofa on the right is a typical Portuguese “conversadeira” with the sofa, mirror and book cupboard. The big cup board in front is made of the Madeira wood “Til”. It comes from the cake shop, Confeiteria Felizberta in Funchal, owned by the early 20th century ex owner of Casa das Videiras. In this room you will also find part of the old kitchen, with its clay and copper pots in front of the oven. Going down to the lounge, you find two guns from the Napoleonic wars, and then some wall sculptures by the Madeira artist Luz Henriques. The tiles on the ground floor walls are all hand painted, and the dining room walls are covered with silk damask. The furniture in the dining room is made of oak, the cupboard old Portuguese and the table, chairs and side board old furniture from Sweden. On the cupboard you also find Chinese ceramic from the Qianlong period. There are also ceramic from the 20th and the 19th century around the house. Some of the paintings are by Heinemann, a Jewish refugee who managed to escape to Sweden before the Second World War. Here you also find some batik pieces that I brought from India. You will also find paintings by Norwegian, Swedish and Polish painters. The wall lamps in the dining room come from the first casino in Madeira, the Quinta Vigia, where earlier the Austrian Empress Sissy had been living. The bed rooms have all different decoration. The ceramics in bed room 1 is made by my mother, the clay virgin sculpture is by a famous Portuguese artist José Franco. In bed room 2 you find a typical Portuguese bed, “Cama de Bilros”, the aquarelles are by an Austrian painter who was living in Madeira, and here you also find a typical needle work tapestry. In bed room 3 you have paintings by the Madeira painter Emanuel Aguiar. In bed room 4 there are twin beds. You will be taken to the secure booking page of our association of rural tourism. If you follow the steps of booking on the upcoming page, you will be able to pay a small deposit using PayPal. You will then receive an online confirmation of this booking on your email, and the accommodation is waiting for you. The Madeira experience is no longer only for the newly wed or for the nearly dead. The Madeira Island has the most amazing nature. The mountains reaches to the sky like rocky monuments, the highest top 1860 m above the sea level, surrounded by the greenest forest, the old laurel trees with the history back to the time before the last ice ages. 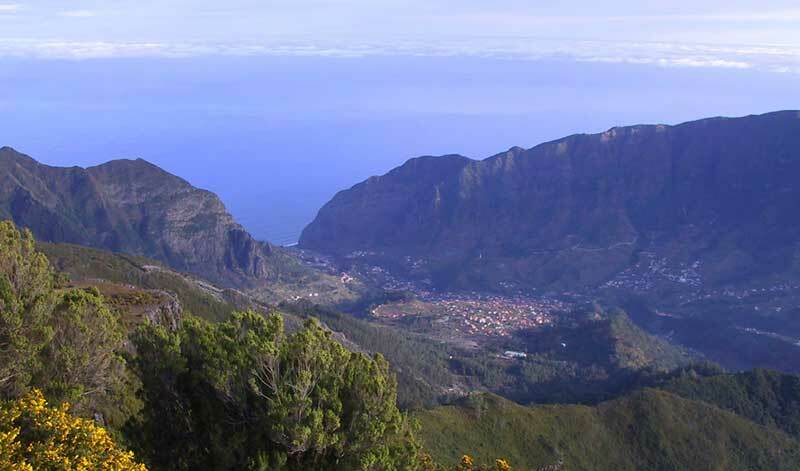 This woods, now a World Heritage called Laurisilva, gave the name to this subtropical Portuguese island, Madeira. The volcano soil is rich and give a harvest with an enormous variety of fruits and vegetables the whole year. Here grow bananas, mangos, custard apples, citrus fruits, passion fruits, figs and even dates alongside sugar canes, corn, sweet potatoes and a list of other vegetables. This Pearl of the Atlantic, also called the flower island, shows flowers and flowering trees the whole year, but in the spring time it is breath taking, both regarding scents and colours. Jacarandas, frangipani, wisteria and bougainvillea compete with the birds of paradise and orchids. This is a floating botanical garden.The sea water temperature oscillates from 17ºC in the coldest February month to 24ºC in the end of the summer. The blue Atlantic Sea is thousands of meters deep, and sperm whales, dolphins and the big sea turtles are seen near the coast.This island of a little less than 60 km long and a little more than 20 km at its widest has a construction of more than 1800 km of waterways or levadas, an irrigation system leading water to and irrigating the plantations. These provide walks that are breath taking in its beauty, however running almost flat. 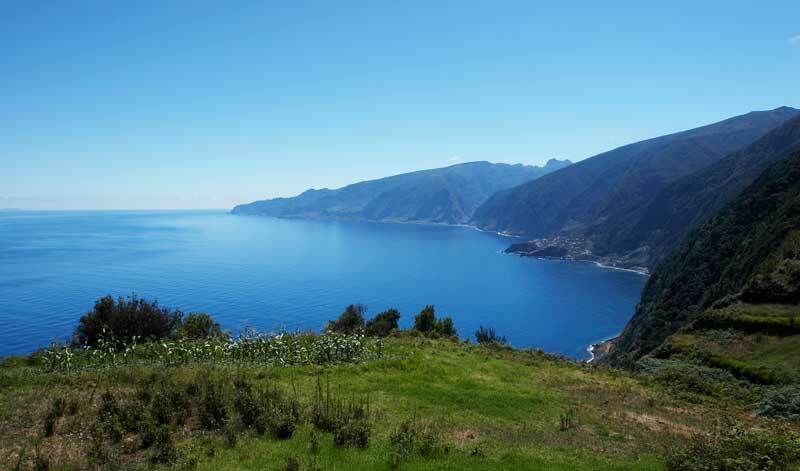 Madeira is sea, mountains and sky. Here you can do diving, swimming, whale watching, surfing, deep sea fishing and coastering the whole year. You can do bird watching, golfing, canyoning, levada walks, forest hikes, mountain biking, mountain walks, mountain climbing or ultra trail if you want to come in a better physical shape. We have also good condition for paragliding. And in the end a fantastic rest in your romantic recidence. Seixal is a small village on the north coast of Madeira. However in area the parish is the biggest in Madeira. 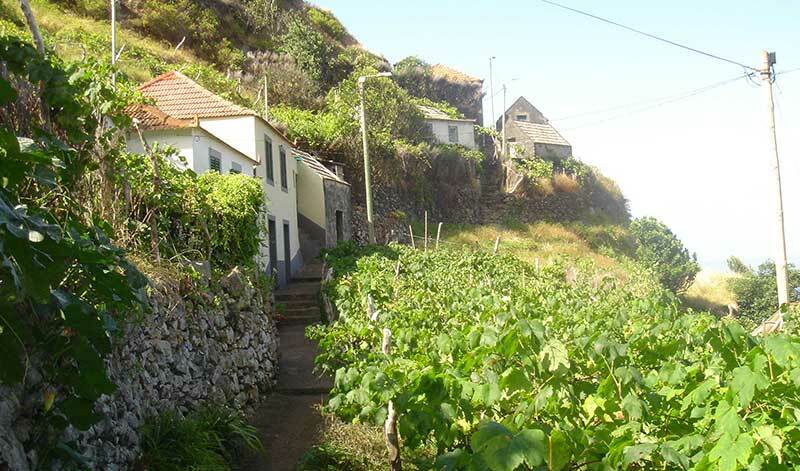 It is an agricultural village, most of the cultivation is done in Chão da Ribeira. 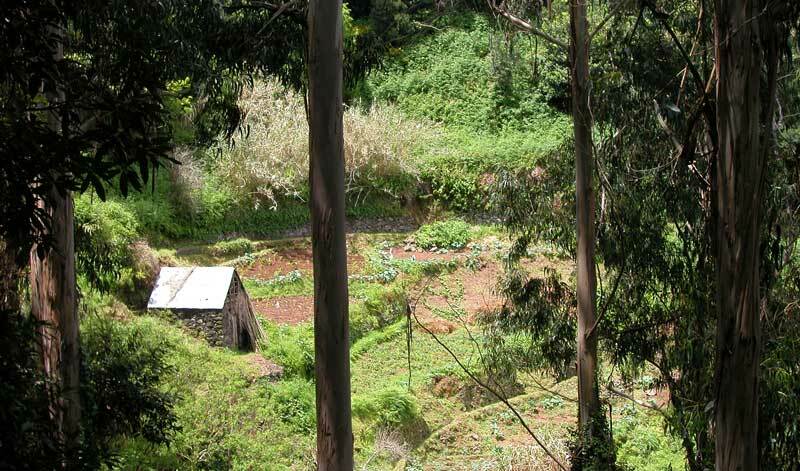 If you take the road up in the valley above Seixal, you will reach this farming landscape surrounded with the “Laurisilva” forest. This forest is a Unesco heritage, being that it is formed before the ice ages. In the inner part of the valley you will find a trout farm, supplying fresh fish to the rest of the island. 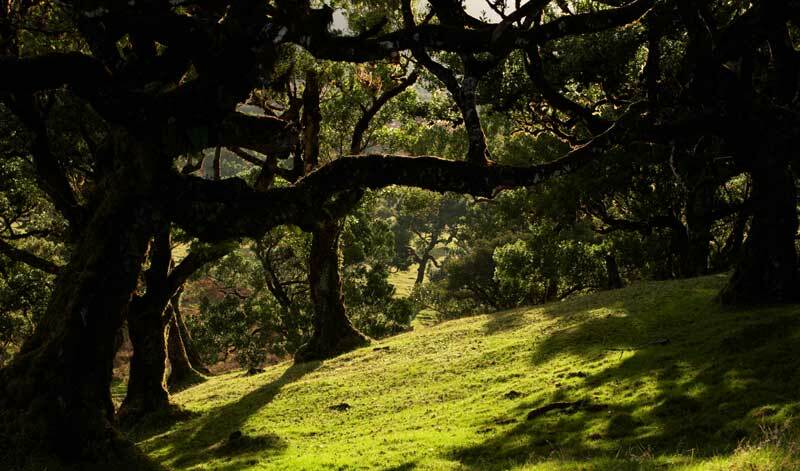 Driving up from Porto Moniz to Poul da Serra you will pass Fanal.Here you find some of the oldest laurel trees in Madeira, a laurel forest almost magical in the early morning or late afternoon. Many of these trees are several centuries old. From here there are walks to Seixal and Ribeira da Janela. The lake is full of water in the winter and dried out in the summer. 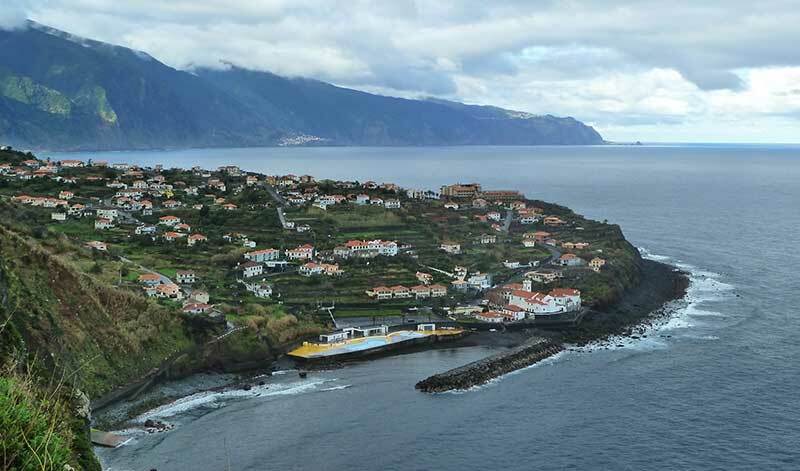 On the way to Porto Moniz, drive or walk up to the hamlet “Ribeira Funda”. This place has just recently got a road. Some years ago you would have to climb the more than 1000 steps in the rock wall to get there. The road they got just a couple of years ago. Still there only lives half a dozen of people in this romantic place. This parish between Seixal and Porto Moniz stretches along the water course from the sea to 1400 meters at Poul da Serra. This valley is the longest one in Madeira. Several trails and levadas are found here. Near the sea is one of the hydraulic electrical plants in the island. Seixal is one of the villages that has a natural sandy beach, two minutes from the Casa das Videiras. Next to the beach, you have Clube Naval do Seixal with a nice sea water pool, water activities and in the weekend’s music, cultural and sometimes gastronomically activities. 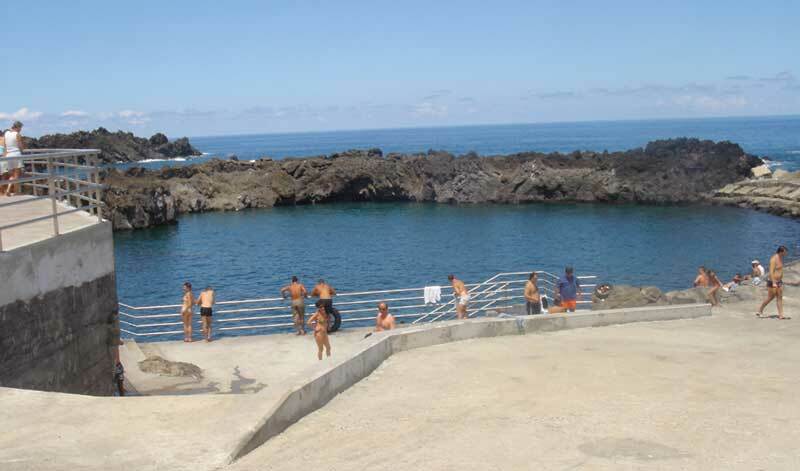 On the west part of the village of Seixal, you will find some natural pools “Picinas” and another beach, “Praia de Laje”. This village is mostly known for its pools. 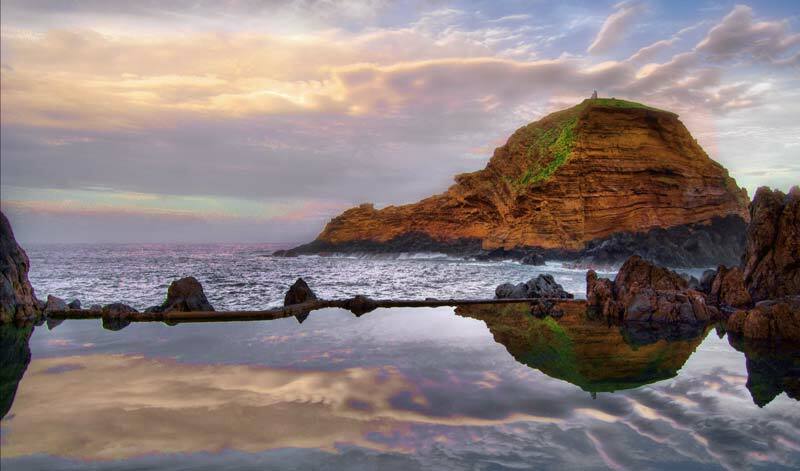 The impressive sea water pools are great alternatives to the ruff sea. In the pool area there is a diving club arranging dives for interested candidates. You can even dive in the local aquarium, something of a treat. This village is sheltered from the sea, originally hidden so that the pirates should not find it. It is romantic to walk along the tiny street around the church in this village.The “Grutas” or volcanic centre is a must. Here you will find a description and show about the geological history of the island, and you can make an 800 meters walk in the old lava tunnels. Madeira has several very rare birds, and many ornithologists are coming to the island to see these species. 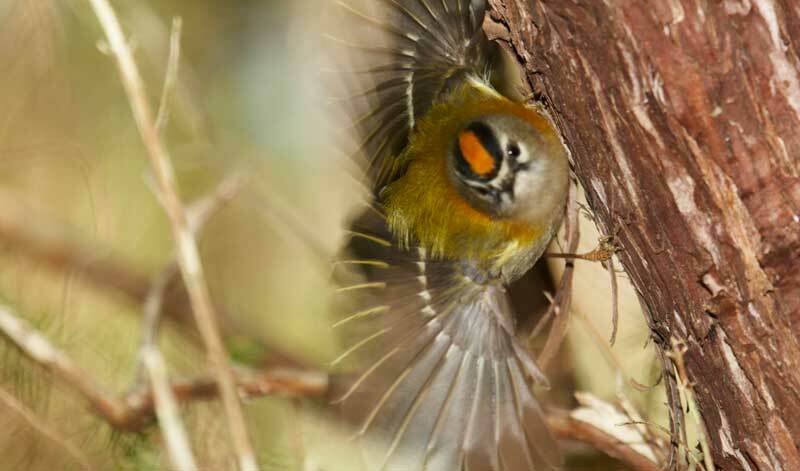 Going into the laurel forest in the morning you can hear and observe the local canary bird or the very small “bis-bis” or the Madeira firecrest. You might also be able to see the Madeiran Woodpigeon. In Seixal, do not forget to take a stroll in the small streets and roads of the village. It is surprisingly beautiful, the people are friendly and hospitable. If you walk up the main road, pass the church, the pools and take the trail down to the beach at the other side of the village. 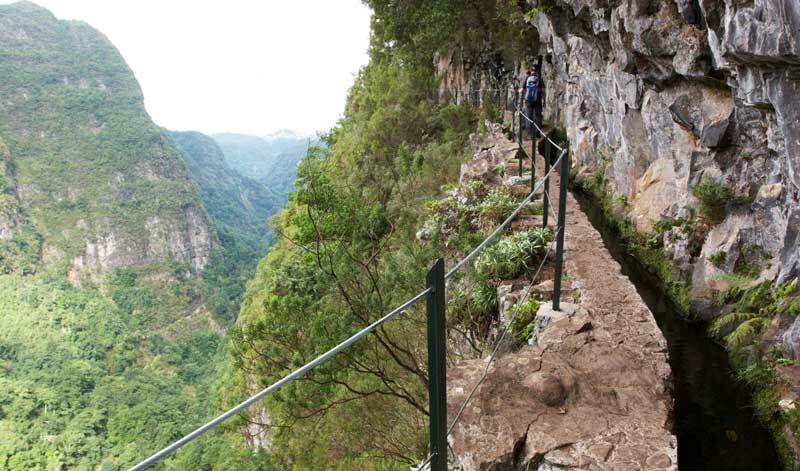 There are longer walks, some of them starting from the valley Chão da Ribeira. To get up to the valley, go the oposite way as this video shows. From the airport you take the highway to Funchal (15 min). Just before entering the city you will find signs, direction Ribeira Brava. Follow this way to the end of the highway (10 min), there you leave the Ribeira Brava road, turn right and go to São Vicente (15 min). Go all the way to the roundabout almost down to the coast. Here you turn direction of Porto Moniz and go along the coast to Seixal (7 min). In Seixal, just before the church, take the road to the port on your right hand side. Just before the last curve, go left and you will find a parking place and the Casa das Videiras. The taxi can be quite expencive. The owner can get you a better fee with arranged transfer. Ask for help. In Seixal: See the Parish Church. Do not forget the two sandy beaches (at the Harbour and Praia da Laje) and the two natural pools (Clube Naval do Seixal and Picinas do Seixal). In Porto Moniz: See the Centro de Ciência Viva do Porto Moniz and theAquario do Porto Moniz. Visit the Cabel car at Achadas da Cruz. In São Vicente: Visit the Grutas de São Vicente. See the village and the church. The small chapel of São Vicente next to the sea. In Ponta Delgada you must see the parish Church of Ponta Delgada. The ceiling is a modern work of art. Just as you come into Seixal, from the east, there is a small supermarket at the left hand side. You will see the boxes with fruit and vegetables outside.After the church, there is another small minimarket and bar on the left hand site. Further on, you have a butcher on the right hand side, and across the street a small hardware shop.There are cars coming with fruit, vegetables and fish several times a week. They park just below the Casa das Videiras. Please ask Natália when they come. However, some more shopping can be done in the Continente Hypermarket in Ribeira Brava.